Diamond Dallas Page debuted in the WWF on the edition of June 18, 2001 of Raw when he unveiled himself as the stalker of The Undertaker's wife, Sara. Page revealed he didn't care about Sara; he only did it to make an impact and wanted to take on the biggest dog in the yard. Page soon joined the Alliance during the WCW Invasion. At King of the Ring, he fought The Undertaker in an unsanctioned brawl that was never announced as an official match.Page and Chris Kanyon reunited on the edition of August 6, 2001 of Raw when Kanyon helped Page attack The Undertaker backstage. Three days later on edition of August 9, 2001 of SmackDown!, Page and Kanyon defeated the APA to win the WWF Tag Team Championship. 2001 KING OF THE RING PPV KICKS OFF! Diamond Dallas Page: DDP said that The Undertaker should be thanking him for only showing the PG tapes of his wife – claiming to have a “private collection” of Sara footage. Paul Heyman & Diamond Dallas Page: As Diamond Dallas Page sat in the front row, Paul Heyman went over to him and told him his actions were a bit brazen. As DDP answered, footage aired of DDP while he privately dined! DDP said he didn’t think the footage was funny, and he didn’t appreciate his personal life being shown like that! Tazz & Chris Jericho: As Chris Jericho prepared for his match, Tazz asked him about the rumors of him going to WCW. Jericho said that he was absolutely aware of the rumors, but he was absolutely not aware that everyone else knew of those rumors. The Dudley Boyz (Bubba & D-Von) defeated Spike Dudley & Kane to retain the WWF Tag Team titles: Spike introduced KANE as his surprise partner. The Dudleyz put the 3D on Spike for the victory. The Dudleyz then attacked Kane, but Kane put Bubba through the table! Diamond Dallas Page: As Diamond Dallas Page sat at ringside, more footage aired of DDQ as he conducted more personal business! DDP demanded for The Undertaker to come out to the ring immediately! Edge defeated Kurt Angle: Christian distracted the referee when Edge was tapping out to Kurt’s ankleLock. Shane McMahon appeared and speared Kurt Angle! Edge got up and hit the Impaler for the win! Your 2001 King of the Ring.. EDGE!! Chris Benoit: Tazz asked Chris Benoit if there was any truth to the WCW rumors flying around. Benoit just said that was a very good question. “King of the Ring” Edge: Jonathan Coachman asked Edge how it felt to be King of the Ring. Christian came in, and told Edge if he only came to the ring to help him earlier! In other words, Edge failed to help Christian in his first round match with Kurt Angle. Jeff Hardy defeated X-Pac to retain the WWF Light Heavyweight title: X-Pac nailed Jeff with an X-Factor, and the referee counted to three! The referee then realized Jeff had his foot on the rope, so the match was restarted. Jeff climbed up to the top rope, hit X-Pac with a Swanton Bomb to retain his Light Heavyweight championship! Stone Cold Steve Austin & Commissioner William Regal: In Commissioner Regal’s office, Stone Cold called Vince McMahon and told him of the WCW/Benoit/Jericho rumors. Regal got on the phone and backed up Austin’s claims. Stone Cold grabbed the phone and told Vince he needed him, and that he could make it in time from Greenwich. Austin then hung up after thanking Vince. Diamond Dallas Page + The Undertaker: More footage aired of DDP as he conducted personal business, causing DDP to fume with anger. DDP climbed over the security walls and entered the ring again. DDP demanded that The Undertaker show his face immediately! After more goading, and more embarrassing footage of DDP was shown, it was revealed that it was Sara who had aired the footage! She told DDP that it was time for him to become famous! The Undertaker came out slowly and the two begin to brawl, with no referee in sight. Sara was there taping every moment with her camera. DDP jumped over the top rope, and then he jumped the barricade and made a hasty exit from the building! Undertaker & wife Sara celebrated in the ring! Kurt Angle defeated Shane McMahon: This was a brutal BloodBath, and incredible match. Kurt Angle grabbed a piece of lumber and started pounding on Shane, and then propped up the board and used it as a platform! Angle & Shane stood on the platform on the top rope and Kurt Angle-slammed Shane into the ring, where Kurt pinned Shane to win the match! After the Street Fight ended, the crowd gave Shane McMahon a standing ovation as he left the ring. Stone Cold Steve Austin: Stone Cold awaited the arrival of Vince McMahon when he was informed that he needed to go to the ring for his match. Stone Cold Steve Austin defeated Chris Jericho and Chris Benoit to retain the WWF Heavyweight title: At first, Jericho & Benoit gang up on Austin, but soon Jericho & Benoit were fighting each other. Outside the ring, Stone Cold grabbed a steel chair, and went after both challengers. WCW champion Booker T entered the arena and slammed Stone Cold through the Spanish announce table! With all three men motionless in the ring, Austin crawled over to Chris Benoit and covered him for the 1-2-3 to win this incredible! The upcoming match was for both the WCW and WWF Tag Team titles between The Brothers of Destruction, Undertaker & Kane with Taker's Wife, Sara against The Alliance's Diamond Dallas Page & Chris Kanyon. 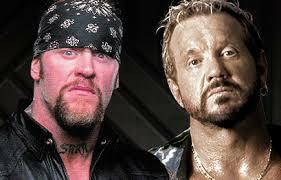 The promo showed that DDP has been messing with Undertaker's personal life and his wife, Sara since the Invasion started. He even built a SHRINE in honor of Sara, stating he just wanted to be famous and now he wants "his" Sara. Undertaker trashing the shrine and being attacked by Kanyon and DDP, with Kane coming to the Rescue, also showing William Regal, congratulating them on winning the WWF Tag Team Titles and that they have to defend them on Summerslam against the B.O.D. in a steel cage match.The match started up as Sara sealed the Cage with a padlock. DDP and Kanyon tried escaping the cage as the bell rang but thanks to Kane and Taker's size, they were brought back in the ring. Taker hit DDP with a big boot, while Kane was choking Kanyon . Taker kept hitting DDP with a series of punches and elbows and Kane kept using the steel cage's walls as a weapon. Kane hit the chokeslam on Kanyon. Taker was about to chokeslam DDP but he hit the Low Blow on him. Kane hit Kanyon with a powerbomb right on the corner of the cage, while Taker used his body on DDP who hit the cage wall. Kanyon after hitting Taker with a flying clothesline, Kane tried to prevent him from escaping, but hit a DDT on him. Both DDP and Kanyon tried escaping, but Taker and Kane both did their iconic Sit Up. Kane kept hitting Kanyon's face on the cage wall, while Undertaker drove DDP's midsection right on the ropes. Undertaker told Kane to let Kanyon go. All that was left was The Undertaker, Kane and DDP, who got one heck of a beating from the brothers of destruction. From Clotheslines to bodyslams. Taker prevented the 3 count as he was ready to punish DDP more, as Kane and Sara looked over Undertaker hammering and kicking DDP . Sara passed the Steel Chain to Taker and he used it as a weapon on DDP. Undertaker was about to hit DDP with the chokeslam but Taker gave him a chance to get out of their sights, without looking onto Sara, saying he would forgive him. But as DDP almost made it to the top, he was stopped by Taker, who completed the chokeslam which he was about to give. Kane helped Taker get DDP onto the Last Ride,which Taker said he is dedicating it to Sara. Taker pinned DDP and won the match, making Kane and Taker a double Tag Champion, gaining a win for the Team WWF.